A late start allows us to catch up on sleep. Applebee feels packed and there are groups of climbers racking gear and prepping for a day of climbing. There are quite a few climbers just milling about too. It feels a bit like Camp 4 in Yosemite. People come and go but regulars emerge and you slowly get to know (or quickly if they're loud) your neighbors. 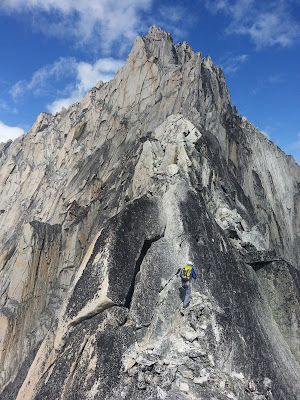 After soaking up some sun and relocating our tents we decide to climb the Kain South Ridge of Bugaboo Spire. 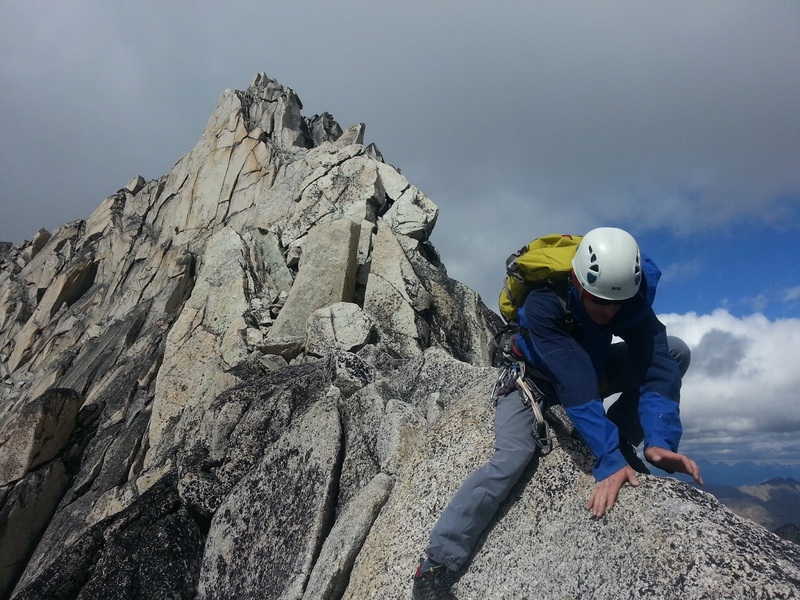 It's a long scramble up the biggest formation that you can see from Applebee, and the line of descent for every route on Bugaboo Spire. It would also allow us to scope out the Bugaboo-Snowpatch Col.
An hour later we're atop the Col. We stash a pack, axes and crampons and begin scrambling the South Ridge. Route finding is mostly straightforward, and except for crossing the gendarme we solo the route. Descending the ridge is easy. Before long we're back at the col with a cold northwest breeze buffeting us. Quickly, we learn that rappelling is the safest way to descend the steep snow at the top of the col. My Black Diamond Contact crampons don't fit my approach shoes well and I lack confidence on my feet. Mountain boots would be nice to have for this descent. A slip on the steep snow would surely land one in the gaping bergschrund below. Our first day here was an easy one, but we greatly underestimated the size of the terrain. The long easy routes in Washington Pass compare favorably to many of the Bugaboo classics, but are dwarfed in size by their Bugaboo counterparts. Even the Kain Ridge, which was technically easy, took us a long time to climb. Back in camp, we settle on the Northeast Ridge of Bugaboo Spire, one of Steck and Roper's 50 Classic Climbs, for the next day's objective. With a good forecast and a crowded campground we know we won't be alone. A 3:30 a.m. alarm should keep us ahead of the masses.